Who’s who in Ireland’s 2014 Eurovision Song Contest semi final? Aka Can Ireland make it to the Final? Adrian Kavanagh, posted on 21st January 2014, with final updates posted on 3rd February 2014. 37 countries will be competing in this year’s Eurovision Song Contest. The previous post identified the countries that Ireland’s 2014 entry will be facing in the second semi final of Eurovision Song Contest 2014 on May 8th 2014, as well as the other countries (“Big 5″/Hosts group) that will be voting in this semi final. The draw for semi-final allocations for this year’s Eurovision Song Contest took place this afternoon in Copenhagen. As the picture above shows, Ireland will be taking part in the second of the semi finals (on May 8th 2014). This will be the smaller of the two semi finals, meaning that Ireland has a better chance of qualifying obviously with one less country to beat! The Big 5/Host countries voting in Ireland’s semi final will be the United Kingdom, Germany and Italy. To get the United Kingdom is excellent news, as they are Ireland’s closest friends statistically when it comes to Eurovision voting. On the other hand, it is bad news to have drawn Italy, as that country has yet to award an Irish act any points at the contest since the Italians returned to Eurovision in 2011. On average, Germany is a rather good draw for Ireland, though it is a pity that the hosts, Denmark, will not be voting in this semi-final, as Denmark has awarded more points to Irish acts, on average, than any other country apart from the United Kingdom since the introduction of the televoting era in 1998. 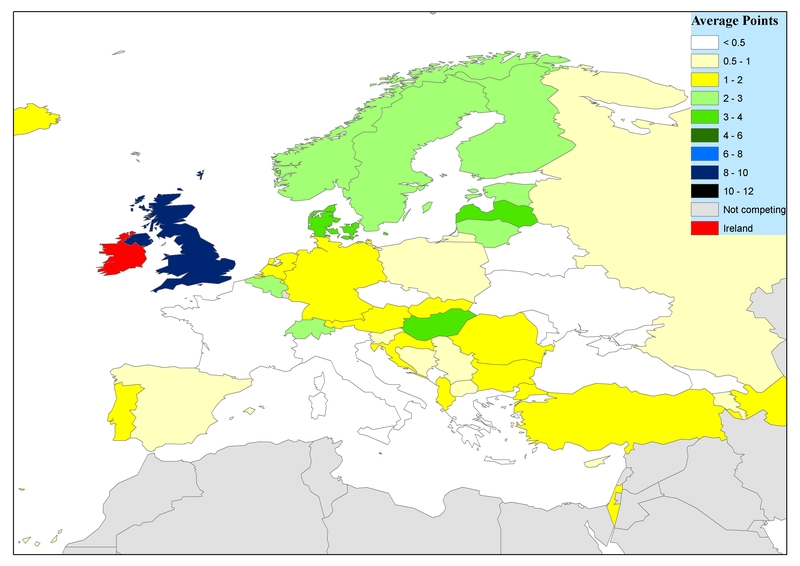 Looking at the positive aspects of the draw – and comparing this to the wish-list developed out of the analysis in the previous post – Ireland will be happy to be drawn with countries such as Malta, Lithuania, Switzerland, Finland and Norway, as these countries have tended to award higher than average points to Irish entries in the decade-a-half-long history of the televoting/50-50 televoting and jury voting eras. Based on past voting trends, a good Irish act would also be hopeful of taking some points off the Polish, Slovene (especially given that there is only one other former-Yugoslav country in this semi final) and Austrian jury voters/televoters. It is also a positive development, from a competition angle, to have missed all of the “big hitters” from the Post-Soviet pot, with Ukraine, Russia and Azerbaijan (as well as Armenia) being drawn into the other semi final. With Sweden also drawn into Semi Final 1, the only really consistently strong countries/consistent qualifiers in Ireland’s semi final would be Greece, Romania and Norway. In effect, Ireland can have little complaints in terms of the countries that they were drawn to compete against from a number of the pots, but most notably Pots 1, 2 and 3. In Semi Final 1 last year, six Former Soviet states took part and all qualified. This year, seven Former Soviet states will be in Semi Final 1 and only three will be in Semi Final 2, so this is another good reason why Semi Final might well be a pretty good draw for Ireland. On a negative aspect, Ireland will be sorry to have not got drawn with either Belgium or the Netherlands from Ireland’s own pot, though it is probably a good thing that the Irish also avoided Armenia from this pot. (With so many countries with large Armenian diaspora voting in Semi Final 1, such as France, Belgium and the Netherlands, and with Estonia, Latvia, Russia and the Ukraine also voting in this, this is shaping up as a dream draw for the Armenians!) Statistically, Ireland would also have preferred to have got Hungary and San Marino from Pot 5 instead of Poland and Austria, but a good Irish entry should be hopeful of winning points from the Poles and the Austrians, all the same. Pot 6 was a mixed bag for the Irish; Ireland would have preferred to have drawn Portugal than Romania, but did draw the Maltese and avoid Moldova – so on the law of averages, this could be looked on as a slightly better than average outcome for Ireland in terms of the Pot 6 selections. 1. Greece 127, 2. Norway 106, 3j. Malta/Romania 97, 5. Israel 75, 6. Lithuania 73, 7j. Georgia/Finland 68, 9. Poland 66, 10. Belarus 58, 11. Ireland 56, 12. Switzerland 44, 13. Austria 43, 14j. FYR Macedonia/Slovenia 33. This analysis would have Ireland just missing out on being one of the ten countries predicted to qualify from this semi-final, but the margins involved are quite tight and there are relatively few points separating Ireland and the countries just falling inside the Top 10, namely Belarus (2 points), Poland (10 points) and Georgia/Finland (12 points). While the analysis suggests that Greece, Norway, Malta and Romania are relatively safe bets to make it to the final, the same cannot be argued in relation to the countries found in the 4th-10th berths of the predicted Top 10 here! Based on past voting trends, the type of Irish entries favoured by some of our strongest friends in this draw, namely Switzerland and Norway, tends to be ballad entries, while up-tempo Irish entries have garnered little interest among the Swiss and Norweigian (and also the Israeli) televoters and juries in recent years. Analysis of the draw for 2014 Eurovision Song Contest semi finals. What countries does Ireland want to be drawn with or avoid?